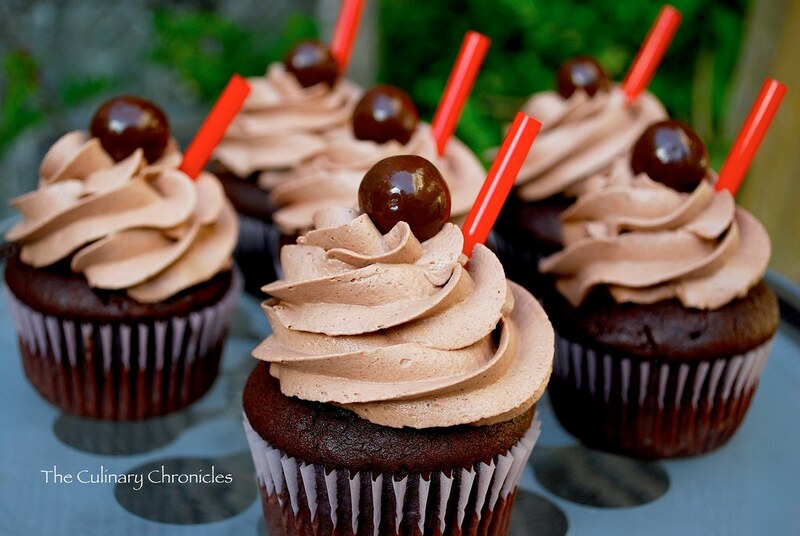 Thus was my inspiration to give these “Chocolate Malt” cuppies a try. I turned to Martha Stewart’s recipe and was happy to find that my sister had a jar of Horlicks Malt Powder on hand. I did make two minor tweaks to her recipe as I read that folks found that the cake didn’t have enough malt flavor. As a result, I increased the malt powder amount by an additional 1/4 cup and folded in a 1/2 cup of chocolate covered malt balls into the batter. As for the recipe, it was quite easy to follow–pretty much a one bowl situation. And when I pulled the cuppies out of the oven, I was pleased to see beautiful even domes on the tops.